Recording continues even when your screen is turned off or other app is opened. No camera preview is visible. No one will know if you are recording. 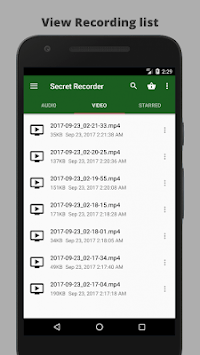 Quickly start video or audio recording. App widgets available for 1 touch recording. • Works when screen is off. • Works silently. No camera preview. • Widgets to quickly start recording video and audio. • Define maximum duration of recording if you want. • Camera: User can record videos through app. • Microphone: User can record audio through app. • Contacts: Show contact list in whitelist/ blacklist feature. 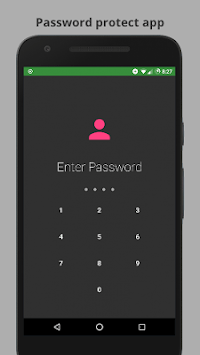 • Phone: User can call contact through app. 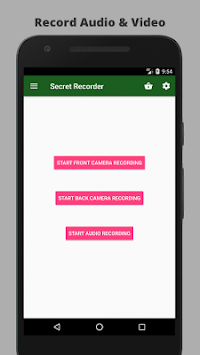 • Storage: Store recordings on Sd card. • SMS: Start recording from another device by sending SMS. • Internet: Help/Guide section needs internet. • Vibration: Enable/Disable vibration at start or stop of recording. Are you still looking for more reasons to install ? Just give it a try and experience yourself. Fix for video recording stopping by itself on some devices. Setting to enable recording to be split into subvideos of maximum 400MB size.